I have always loved yoga. I don’t do it that often, but I have done it a handful of times with Lil or at least she’s seen me do it. Every once in a while she’ll say she wants to do some yoga so we’ll do a few minutes and then she loses interest. A few days ago she was hanging out with Waldo while I worked and she walked in all the sudden and informed me that she wanted to do some yoga so she put on her ballet tutu and wanted to know if she could use my yoga mat. I told her where it was and then the next thing I know I get a text from Waldo with this picture attached. We texted back and forth about this for a minute and then he texted me ‘I can’t believe you’re missing this’. I couldn’t believe I was missing it either so I got up and walked the huge distance to the bedroom and couldn’t believe what I was seeing. 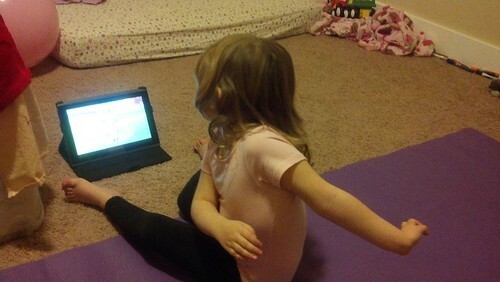 Lily told waldo to find a yoga video online for her. He found a really good one, turned it on and she totally did the whole 15 minutes and then asked for more. She ended up doing about 30 minutes of yoga and kept wanting to do more. It was one of those great moments for me. I can’t wait to do more yoga with my kiddo. This entry was posted in Life, Lily, Phone pictures, video and tagged Lil, Mobile randomness, video.